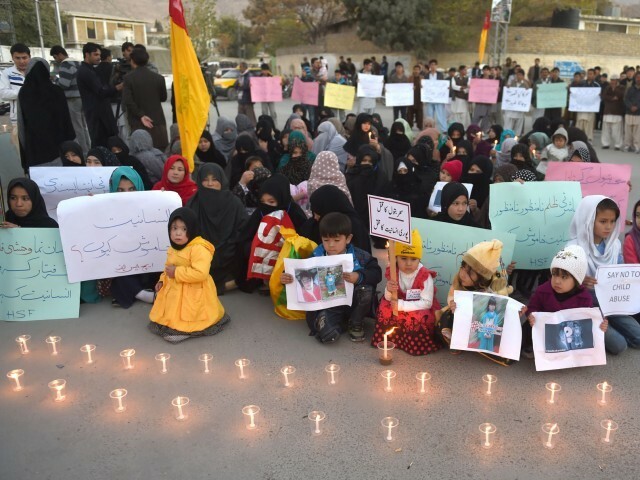 The Hazara community on Saturday protested against seven-year-old Saher Batool’s murder outside the Balochistan police chief’s office in Quetta. They demanded the immediate arrest of the murderers who had strangled the girl after subjecting her to brutal torture. The hour-long procession was organised by the Hazara Student Federal (HSF) and the Hazara Democratic Party (HDP). Women, children and men carried banners and placards marched towards IG Balochistan’s office, where they held a candlelight vigil as well. The victim’s parents and siblings also took part in the protest. They raised slogans against law enforcing agencies for their failure to trace the culprits involved in the crime. “We demand the immediate arrest of the criminals, they should be brought to justice,” Raza Mohammed Wakeel, leader of the HDP, said while addressing the protesters. “All I want from the law enforcers is to book the perpetrators,” said Ghulam Sakhi Khan, father of the victim. According to Quetta police, there has been no progress in the investigation into the murder so far. There are different rumours about the brutal murder of the seven-year-old girl. However, police say a person who was accused in the case had died a couple of years ago. “We are properly investigating the incident and cannot go on claims and rumours,” said SHO Bijili Road Police Station Asim Shah.